William A. Scott III moved with his family to Atlanta in 1928 at the age of five. His father founded the Atlanta Daily World, one of the most influential African American newspapers in the nation. W. A., as he was known, studied business administration and mathematics at Morehouse College. 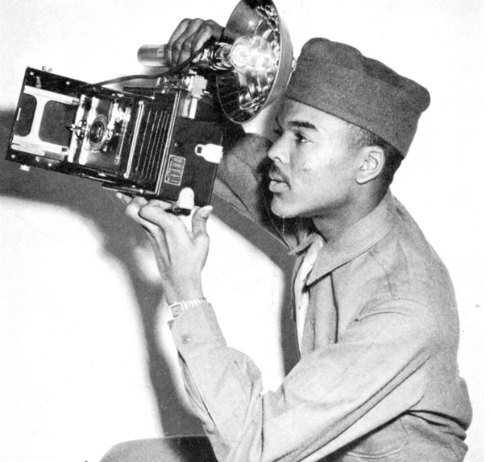 Drafted into the U.S. Army, W. A. served as a reconnaissance sergeant, photographer, and part-time historian in the intelligence section of the 183rd Engineer Combat Battalion. In April 1945, he was one of the first Allied soldiers to enter and photograph survivors of Buchenwald concentration camp. In 1991, a year before his death, W.A. was honored for his valiant service in World War II and was appointed to the United States Holocaust Memorial Council by President George H. W. Bush. "And we went over across the channel. And we got off at Le Havre. We went up through Le Havre. The forces had moved on in, and we were able to go up to get off at Rouen, as I remember it." You can view the oral history he recorded with the United States Holocaust Memorial Museum here.